Felt is made by a process called 'wet felting'. Natural wool fibres are agitated together using soap, warm water and lots of elbow grease. This 'wet' process uses the inherent nature of wool. The hairs have scales on them (like the structure of a pine cone). The alkalinity of the soap and warm water encourages the scales to bend away from the hair shaft. Stimulation and friction helps the scales to link together with one another, matting them together to form a non-woven fabric. Nuno is a Japanese word meaning cloth. Wool fibres are laid on top of a fabric then agitated together with soap and water. This forces the tiny scales to penetrate the weave of the fabric and bond with it, silk and cotton muslin are the fabrics most used for this process. Wool fibres can totally cover the fabric or be used in whisps either on one side or both They create a thin, soft floaty fabric that is very delicate yet durable. Needle felting is a dry felting process with no soap and water. 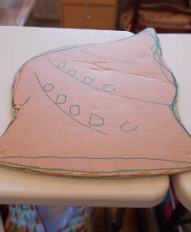 It involves no sewing, instead it uses special needles which have notches cut in them. By prodding the needle over and over into the wool fibres, this forces the fibres to knit together. In this way lots of different shapes can be made - a sort of sculpting with wool. A 'resist' is a template or shape around which the felt is made. The resist is then removed to leave the felted object. Resists can be made of a variety of things e.g. cardboard, plastic, bubble wrap. It prevents areas of wool from felting to other areas that you don't want it to. It is commonly used to make felted hats or vessels.